Peter Schmidt - Blog - Google and social, go together? So here's one experience I've just had - and an insight into why it's sometimes said Google doesn't get social. Social is about conversation and interaction - here's something I can do for you, would you mind doing this for me? So here's why - the first comment on this blog, 3 months ago. Discovered by me just because I decided to go back and see what I was writing on this humble weblog, see what I was thinking. 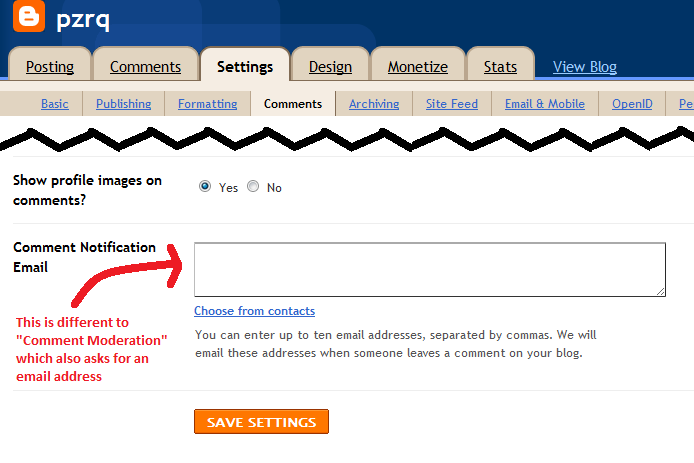 Now Blogger has the option to turn on comment notification email. But if I'm not Engadget, Gizmodo, Dvorak, i.e. someone or something that can afford a real hosting / blogging / content management solution, this is the kind of thing I'd like to know about! Basically this "Comment Notification Email" box, buried at the bottom of Settings > Comments, should have had the email address I signed up with. It's not spam if its a real person behind the scenes (and the link that's not a link and contains the Session ID and a blog behind it is a clear example of that =). And it's easy enough to link back to these settings in such an email so if the user decides it is spam - they have the option to turn it off. Google - time to listen to dear leader turned advisor and think a little less engineering and a little more social. We'll like you more for it, promise! Lovely Site, Carry on the wonderful job. Thanks for your time! This is an extremely intriguing site which is having data about designing and science. Valuable post about online networking and Google. It's an uncommon administration that Google offers that permits you to effectively find. This write essay through the online, that are very useful and all the process are through the online it is the buy a essay and good papers through online, very useful thank you for give a good chance to me.